Our ladybug mold category offers molds for concrete, plaster and soap. 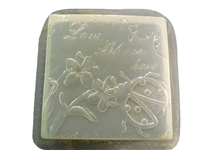 All of our ladybug molds can be used with concrete, cement, plaster soap or resin. Try using one of ladybug molds to create unique pieces for your rock gardens, or maybe use one of our ladybug molds for making decorative stepping stones through your garden.